Tack coats and pavement bonding have been garnering significant attention in the asphalt world. A number of states have already or are sponsoring research on the topic. This is a very good thing as pavement bonding is essential to quality pavement performance. 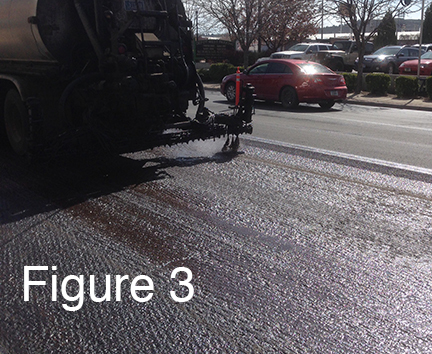 A National Cooperative Highway Research Project (NCHRP), 9-40, “Optimization of Tack Coat for HMA Placement”, investigated tack coat usage and practices that will improve pavement bonding. The final report for the project is Report 712. Beginning in January of 2015, the Asphalt Institute (AI) and the Federal Highway Administration (FHWA) have been leading four-hour tack coat workshops for state departments of transportation around the United States. The structure of these workshops is similar to the previously launched longitudinal joint and intelligent compaction workshops also done with FHWA. Consistent with the others, the tack coat workshop is offered to the states without a fee. Transportation departments (DOTs) are asked to provide the host facility and any refreshments they choose to make available. AI and FHWA provide all instructor expenses and resources. To date, 36 states have expressed interest in this workshop, with 24 either completed or scheduled. An early feature of each tack coat workshop is ascertaining and establishing questions attendees have related to tack coats they are hoping to have answered or addressed during the workshop. As might be expected, a number of questions have been raised repeatedly. I would like to address the most common questions and then offer some additional general discussion on good tack practices to help achieve good pavement bonding. What materials can be used for a tack coat? While any of the classes of asphalt (emulsions, paving grades or cutbacks), can be used as a tack coat, by far the most commonly chosen are the asphalt emulsions. Of the three, cutbacks are by far the least common and they are increasingly less of a player in this arena. NCHRP Report 712 reported that all the respondents to a survey allowed the use of asphalt emulsions for tack coats. By comparison, only 27 and 20 percent of respondents allow paving grades and cutbacks, respectively. Emulsions are a combination of a paving grade asphalt binder blended with water and an emulsifying agent to keep these dissimilar materials in suspension together. Slow setting emulsions are the most common emulsion utilized as tack. When slow set emulsions are used, they are frequently diluted with additional water. The most common dilution is 1:1, one part emulsion and one part additional water. Historically, dilution was used to aid application uniformity. Today’s technologically advanced distributor trucks do not need dilution to achieve uniformity. Other emulsions being employed include rapid sets, quick sets and reduced or non-tracking emulsions. For any non-slow set emulsion – dilution is not an option, but typically paving can commence more quickly as emulsion breaks occur faster. Paving grade binders are another option for tack coats. Their lack of water means no breaking of the tack is required. Thus, paving can commence immediately following the application of the tack. The paving grade that is being used for a tack coat is typically the same binder used in the mix being placed. This eliminates the need for additional material storage. What preparation does the surface need prior to the application of tack coat? Research has verified what has long been held as best practice for the surface condition of the receiving pavement. Namely, a clean, dry surface maximizes layer bonding. Milling of the existing surface has also been shown to typically increase bond strengths. However, milling does produce dust and it uses water. Both need to be eliminated from the milled surface prior to application of tack. Sweeping of the milled surface is typical. Judgement should be exercised in timing of the sweeping, as it will be most efficient after any moisture left from the milling has evaporated. Between lifts of fresh asphalt, cleaning is commonly not needed. However, if the freshly laid pavement has become dirty it behooves the contractor to clean any and all such locations prior to the next lift being tacked and paved. Interestingly, NCHRP Report 712 showed mixed results for bond strength when tack materials were applied to a moist surface. Generally, no consistent trends were reported. For some surfaces and tack coat material combinations, dry conditions had greater bond strengths, while for others, damp conditions showed greater numbers. Report 712 did specifically mention that for PG 64-22 tack on a moist portland cement concrete (PCC) surface, the bond strengths were lower than it considered adequate at typical rates. Moreover, the report notes that their experimentation was very controlled and it specifically recommends a dry surface condition as most desirable. When, if ever, can tack be eliminated between lifts? Scenarios where this question comes up are usually when new materials are being paved upon and on milled surfaces. Let’s address both situations. A ribbon of asphalt has been placed and a second lift is going to be placed upon it shortly after the first went down. The two lifts may even be on the same workday. Is tack still needed? Yes, it is! Multiple research efforts have shown that with minimal loss of bond strength, 10-30 percent, a significant loss in fatigue life can result, 50-70 percent. Moreover, an analysis of bid tabs using 2013 data shows that the cost of tack coat is relatively minor compared to other components of a typical paving project. Therefore, the risk of a poor or a compromised bond from not applying tack is deemed too great when one considers the ramifications of the loss of fatigue life from this condition. Tack is such a cheap component that it makes little sense to shortchange this critical step and introduce so much risk. The other common condition where the question of skipping the tack comes up is that of a milled surface. While some research indicates the skipping of tack on a milled surface will still result in adequate bonding of layers, the weight of research indicates that the use of tack improves the bond of a milled surface that has been properly cleaned. As with the first scenario, the cost of tack is so small relative to the cost of premature pavement failure, it is foolhardy to skip applying tack. The Asphalt Institute recommends tacking between all lifts. When can paving commence on an emulsion? 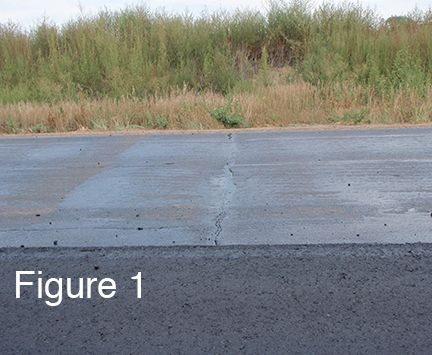 Both specifications and research are not in universal agreement on when paving can be initiated after an emulsified tack coat has been sprayed. Consistent with long-standing recommendations from the Asphalt Institute, most specifications require an emulsion break before the start of paving. Moreover, the tracking of an emulsion is generally reduced as the water leaves the emulsion. Thus, an emulsion that has broken will generally be less prone to tracking than a fresh emulsion. Similarly, a set emulsion will generally be less prone to tracking than one that is merely broken. Allowing the tack to break can alleviate contractor headaches associated with the tracking of a tack coat. And while waiting for it to set would further reduce tracking issues, the time generally required for this condition to occur is more of a delay to paving than is often considered practical. Again, if a paving grade asphalt is used as a tack coat, no break or set time is required as the paving grades have no water in them. What is the optimal application rate for a tack coat? A variety of factors have been identified that influence the optimal application rate for an emulsion. Some of the more influential factors include the surface type, the surface condition, and the gradation properties. When discussing surface type, four categories generally come into play: new asphalt, existing asphalt, milled surface or PCC. 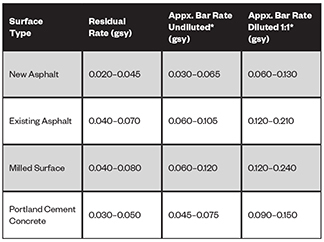 The surface type was primarily used to develop the table below which shows Asphalt Institute recommended ranges for each. The other factors then come into play to influence where, within the shown ranges, one would be wise to apply the tack. For example, an existing flushed asphalt surface would call for a lower application typically than an existing raveled asphalt surface. Similarly, a fine-graded overlay will generally need less tack than a coarse-graded overlay. In general, the more open the mix, the greater the application of tack required to achieve a good bond. Good tack coat practices are imperative to assuring good pavement performance. Once the surface has been properly prepared, application of tack coat can proceed. Tack coat applications should be uniform and consistent both transversely and longitudinally. An example of inconsistency in both directions can be seen in Figure 1. Applications such as this will not produce acceptable bond strengths. 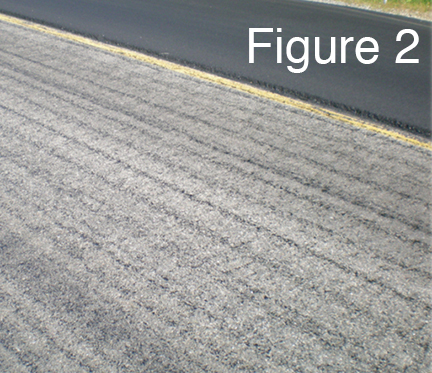 Unfortunately, it is not uncommon to see tack coat applications that are streaky or striped in appearance (as seen in Figure 2). Some refer to this as “zebra tack” and it does not produce good bond strengths. Recall that some researchers reported that a small loss in bond strength resulted in a significant loss in fatigue life. Neither of these pavements (Figure 1 and 2) can be expected to perform to their full potential. An example of exemplary contractor conscientiousness is seen in Figure 3. Here a contractor applied a very uniform tack coat to most of the milled surface. Unfortunately they missed one narrow section. However, instead of ignoring this miss and considering it “good enough”, they applied material to the missed section. Selection of an appropriate tack coat material, applied in the recommended ranges, provides the glue necessary to the pavement for bonding. Attention to surface preparation in creating a clean and dry material is desirous for bonding. Milling of existing surface materials will further improve bonding capabilities, thus typically improving pavement performance. Applying the tack material in a consistent and uniform manner aids in the achievement of good pavement bonding. Neglect or omission of this minor component can result in major failure of the pavement. This unnecessarily taxes an agency’s budget, disrupts drivers, and wastes natural resources. Johnson is an Asphalt Institute Regional Engineer based in Montana. The NCHRP Report 712 can be downloaded at trb.org.